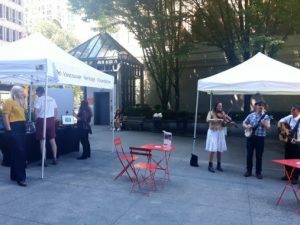 This summer join the Vancouver Heritage Foundation on your lunch break for a series of fun, interactive heritage pop-ups. On select Wednesdays in July and August they’ll be setting up their tent with various heritage-themed items and displays that represent the architectural legacy of the downtown area through the decades. Each week will feature a different era. All events are free and open to the public. A musical duo featuring bass player Jen Hodge, artist Edward Juan continues work on an illustrative map of historic Vancouver and a 1920s selection of antiques and archival images. Archival images, antiques from Spacelab Antiques and bassist Jen Hodge and accompanist return. We will also enjoy a swing dancing demonstration and check in with Artist Edward Juan as he continues work on the illustrative map. Songstress Krystle Dos Santos helps us explore the vibrant mid-century years with soul classics, and we’ll have more archival images and antiques to see. Musical group the Hard Rock Miners highlight some of the great acts that toured through Vancouver in the 70s and 80s, and if you’re feeling inspired, you may even get to sing along with the group! We’ll also have images of the era, including some throwbacks from Expo ’86, as well as some fun items from Spacelab Antiques. Follow the Vancouver Heritage Foundation on Facebook and Twitter for more information.